Just like no two Laddoos are the same made by the same hands at the same time, in the same way no two wives are same. 😉 . While I was eyeing them, and thinking this, my hubby managed to gulp down two of them. And when I shared with him my thoughts, another two were gone. 😀 . He simply nodded in agreement while enjoying my short lecture. I was telling him , not to compare me with others and so on. Then I realized, that if I continued I won’t get even one. So I quickly picked up one and save four for my neighbors and went inside. 🙂 .I wasn’t able to click any pictures though. But this time, I managed to take atleast a few pictures ,while he is in the office. The recipe is the same as followed in every Indian household traditionally. The only twist is I used the coarse variety of Besan (chickpea flour) and to my surprise it absorbed much less Ghee than the finer one. I like the traditional method more than the microwave and no ghee ones ; both from health and taste perspective. 1. Take a non-stick or heavy bottomed wok (kadhai) or pan. Add 1 tbsp ghee (clarified butter) in it. 2. Add Gond in it and let it puff up on medium heat. Stir them continously to avoid burning. Take them out in a plate once it is fully puffed and cooked on all sides. This will take 3 to 5 mins in all. 3. In the same wok, now add the remainig ghee(clarified butter) and add the besan in it. Roast it on medium heat till all the ghee is well mixed in it. 4. Continue roasting while stirring till the color of the besan changes and gets darker in color. It will smell aromatic now. This would take about 15 to 18 mins. Turn off the heat and continue stirring for even roasting of the besan. If gond is clean, you can add it directly to this hot besan-ghee mixture for puffing it. But if you are not sure, then fry it separately as in Step 2. In between, chop your cashews for mixing in the pinni towards the end. Also keep aside some halves for topping and garnishing in the end. 5. Transfer the contents to a parat(tureen) or a large bowl and stir them while adding the almonds, cardamom powder and cashews . You may add walnuts, raisins too if you like. Stirring helps to bring down the temperature. 6. After about 5 mins , add Bura(Tagar) to it and mix it well with the same spatula (used in cooking). Bura/bhura is a north-Indian unrefined sugar , prepared directly from juice without any filteration or additives. 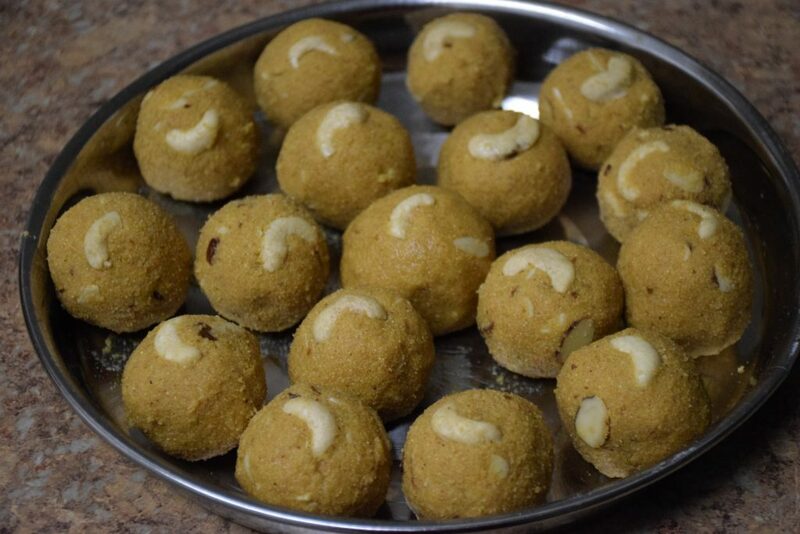 It gives a coarse texture to the laddoos. You may use white granulated sugar (refined sugar) in its absence. 7. While the mixture is still warm to touch, pick some portion and roll it between your fingers and palm such that they form a roundel. You may use a cap or mold to shape them. I didn’t feel the need of adding ghee to it. But if by chance, you are not able to roll them at the right time, and the mixture cools down. You can heat a tbsp of ghee and add it in the mixture to start the binding. 8. While rolling them ,you would see your hands glistening with ghee used in them. Similarly roll all the laddoos and store them in air -tight container once cooled to room temperature. You may garnish them with half cashew pieces while rolling. Yes,forgot to tell you ,that they break down just by nudging . I dedicate this recipe to my Mom and my mother’s mom. My grandma’s laddu remain unbeatable though. You can double the recipe by doubling all the ingredients. I prepared them in a small batch. 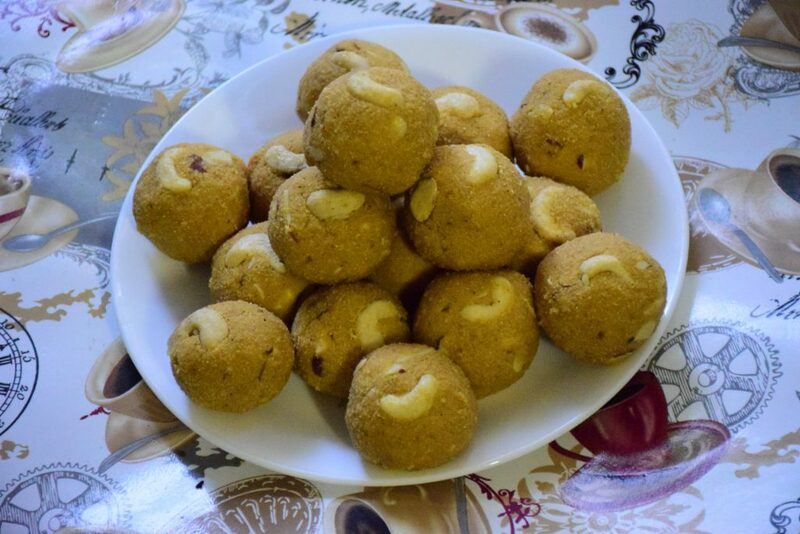 For more recipes of laddoo or pinni check this : Atte-Besan ke laddoo, Urad Dal ki Pinni, Mathura ke pede, Alsi ke laddoo, moong dal barfi, Boondi ke laddoo, Gur ki panjiri, Sukhdi/ aate-gur ki panjiri etc. Thank you for being a patient reader ! Hope you like it and share it with your friends ! Just like no two Laddoos are the same made by the same hands at the same time, in the same way no two wives are same. 😉 . While I was eyeing them, and thinking this, my hubby managed to gulp down two of them. And when I shared with him my thoughts, another two were gone. 😀 . He simply nodded in agreement while enjoying my short lecture. I was telling him , not to compare me with others and so on..
Then I realized, that if I continued I won't get even one. So I quickly picked up one and save four for my neighbors and went inside. 🙂 .I wasn't able to click any pictures though. But this time, I managed to take atleast a few pictures ,while he is in the office. The recipe is the same as followed in every Indian household traditionally. The only twist is I used the coarse variety of Besan (chickpea flour) and to my surprise it absorbed much less Ghee than the finer one. I like the traditional method more than the microwave and no ghee ones ; both from health and taste perspective. Take a non-stick or heavy bottomed wok (kadhai) or pan. Add 1 tbsp ghee (clarified butter) in it. Add Gond in it and let it puff up on medium heat. Stir them continously to avoid burning. Take them out in a plate once it is fully puffed and cooked on all sides. This will take 3 to 5 mins in all. In the same wok, now add the remainig ghee(clarified butter) and add the besan in it. Roast it on medium heat till all the ghee is well mixed in it. Continue roasting while stirring till the color of the besan changes and gets darker in color. It will smell aromatic now. This would take about 15 to 18 mins. Turn off the heat and continue stirring for even roasting of the besan. If gond is clean, you can add it directly to this hot besan-ghee mixture for puffing it. But if you are not sure, then fry it separately as in Step 2. In between, chop your cashews for mixing in the pinni towards the end. Also keep aside some halves for topping and garnishing in the end. Transfer the contents to a parat(tureen) or a large bowl and stir them while adding the almonds, cardamom powder and cashews . You may add walnuts, raisins too if you like. Stirring helps to bring down the temperature. After about 5 mins , add Bura(Tagar) to it and mix it well with the same spatula (used in cooking). Bura/bhura is a north-Indian unrefined sugar , prepared directly from juice without any filteration or additives. 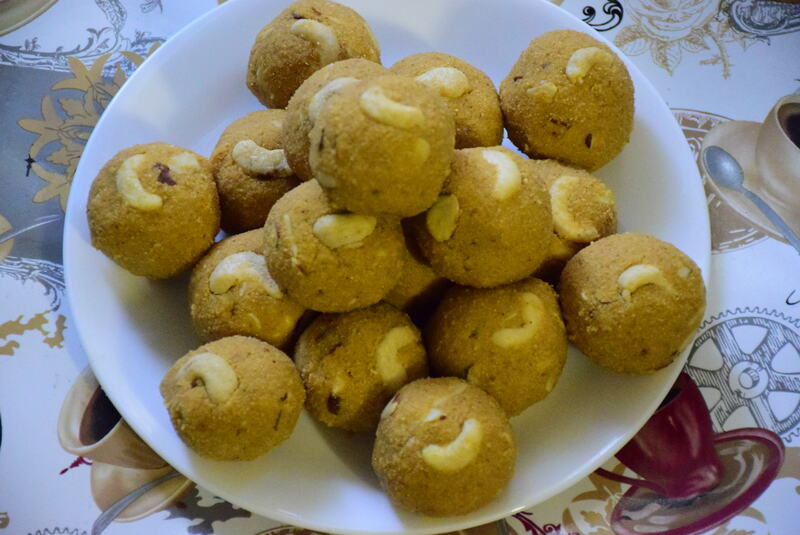 It gives a coarse texture to the laddoos. You may use white granulated sugar (refined sugar) in its absence. While the mixture is still warm to touch, pick some portion and roll it between your fingers and palm such that they form a roundel. You may use a cap or mold to shape them. I didn't feel the need of adding ghee to it. But if by chance, you are not able to roll them at the right time, and the mixture cools down. You can heat a tbsp of ghee and add it in the mixture to start the binding. While rolling them ,you would see your hands glistening with ghee used in them. Similarly roll all the laddoos and store them in air -tight container once cooled to room temperature. You may garnish them with half cashew pieces while rolling. 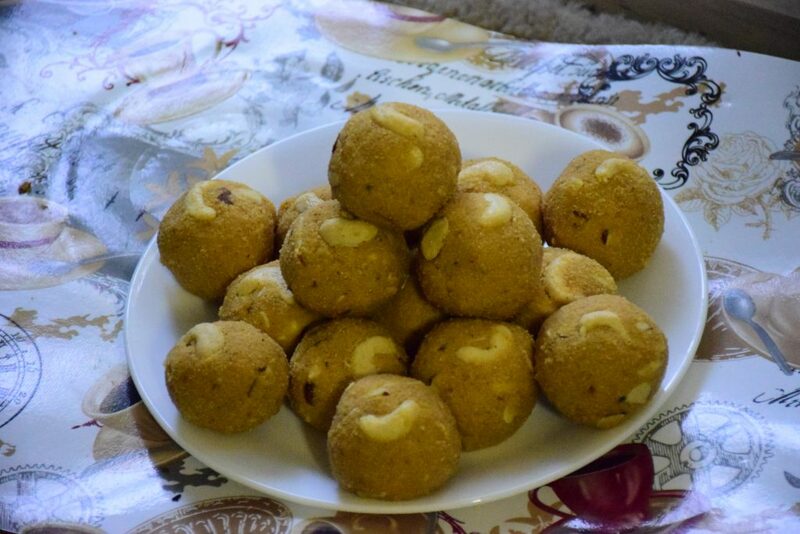 This entry was posted in Desserts, Food, Recipes and tagged Besan ke laddoo, besan ke laddu, Besan ke laddu from Laddu besan, Besan ki pinni, bhura, Bhurbhure, bones, bura, cardamom powder, crushed cardamom, Delicious and healthy, Easy winter recipe, Edible gum, Gond, healthy, Indian sugar made from juice, Indian sweet, Indian unrefined sugar, joint pain, mouth-watering, muscles, my hubby's favourite, no two are same, non-sticky, north india, North Indian sweet, Pisi hui elaichi, soft, tagar.